Our mission is to ensure the legacy of the old Sylvan Chapel as a center for cultural, visual and performing arts programs. The Fox Island Chapel Preservation Society, a community based non-profit corporation, owns, maintains, and operates the historic Chapel on Echo Bay. The Society serves the greater community by providing a variety of services and programs that maintain and perpetuate the integrity and spirit of the one-hundred-year-old Chapel. In addition to preserving the facility as an historic site and heritage center, the Society provides activities including educational programs, recitals, concerts, and other visual and performing arts events. The roots go deep. They reach back across the century to pioneer families who came to Fox Island from Grinnell, Iowa and started the Congregational Church of Sylvan in 1892. They named their settlement “Sylvan-Glen” in honor of the wooded beauty surrounding them and became the first permanent colony on this remote island. 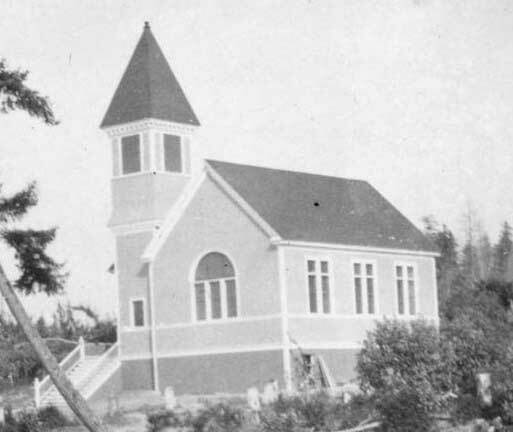 On August 19, 1900, “Eells Bell” rang out high atop in the new steeple announcing the dedication of the lovely white Chapel on Echo Bay. Why “Echo Bay”? This sheltered cove on northeastern Fox Island was so named for the legend that says an echo will resound seven times around the bay before it fades away. Echoes of the past still seem to fill the cozy sanctuary which, over time, has served as celebration center, library, meeting hall, and performance venue as well as a house of worship and heart and soul of the island community’s heritage. The Fox Island Chapel Preservation Society was formed in 1999 and acquired the facility in January of 2000. In a two-year project, the lower floor was renovated including a new kitchen, a bridal party dressing area and a spectacular reception room that opens to the waterfront garden. The beautiful new reception hall is a perfect facility for workshops, retreats, family events, business meetings, art shows, etc.